The amount of fairy princess party supplies you purchase depends on the amount you want to spend and the depth of the party theme itself. Whether you pick up just the essentials or go the extra distance, a fairy princess party needs a few things to create a magical experience for the kids. A fairy princess party is an excellent theme for a girl's birthday party or even a play date for youngsters. Consider getting just a few essentials and letting the kids' imaginations create the party experience. Invitations: Create your own invitations by cutting out wings from cardstock and decorating with glitter after adding the pertinent information. Otherwise, seek out princess party invitations and add some "fairy dust" (glitter) to the inside of the invitation envelope. Fill-in-the blank invitations are also available at local party supply stores and online retailers. Tableware: Even if you don't have the time, money or inclination to decorate your home to represent a fairy princess palace, create a theme by setting the table with matching paper plates. Choose coordinating colors of napkins and cups to make a cohesive table with the theme. Cake: A fairy princess cake is an essential ending to the party. Choose a simple sheet cake with a piped fairy princess or go for an elaborate, sculpted castle that doubles as a centerpiece. Play some simple fairy princess party games utilizing the theme, such as FAIRY (played like BINGO) that you can make on your computer at home. Allow the kids to dress up like fairies using old clothes, or make the party a costume party, with the girls wearing their own fairy princess outfits.Purchasing and making essential party supplies for a fairy princess theme is a great way to get creative and save money. When time and/or budget allows, add a few extra fairy princess party supplies to the list and create a fantasy world fit for any little girl. While they are not required for the party, the extras add ambiance that makes the magical world of fairy princesses come to life. Fairy princess parties often have soft pastel colors, so choose accent items (like tablecloths and chair covers) in lavender, pink or light green. Decorations truly set the scene for a themed party, so adding just a few items makes the party perfect for any fairy princess and her pals. Food favors are always a big hit with kids, so consider making cookies decorated with royal icing in the shape of a tiara or wings. A brownie or cupcake with the words "Fairy Princess Madeline" piped on are also a big hit, too. Add some edible glitter for a sparkling treat to send home. 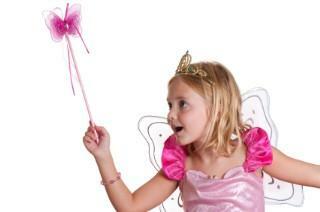 Fairy princess party supplies create a memorable theme for any special occasion in a little girl's life. Whether you choose to go with the bare essentials or add a few extras, the kids are sure to enjoy a fun-filled afternoon with their princess and fairy friends.